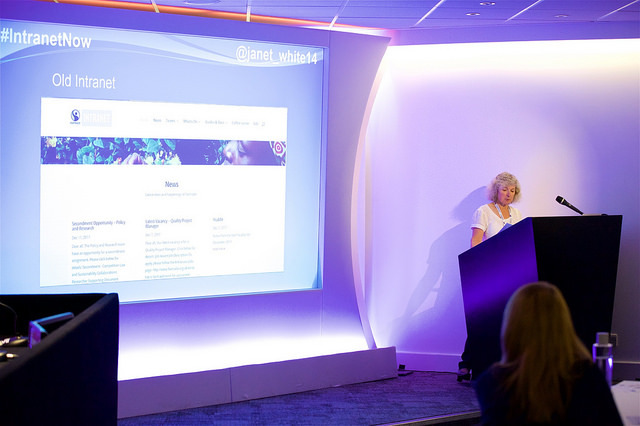 Last Friday saw the fifth Intranet Now conference, and the first after co-founder Brian Lamb stepped down. Lisa Riemers joined the remaining founder Wedge Black to introduce a series of lightning talks and mini-workshops. I was attending as a speaker and volunteer. Billy joined Invotra as an apprentice an absurdly short time ago, and now he is opening the UK’s most important intranet conference. He introduced an increasingly familiar world of gig working, and made an important point that often gig workers are kept at arms length, and are disengaged, from company intranets. This was a talk that was both practical and insightful, and it also introduced a new area for intranet people to consider. Talking about recent work at the Hyde Housing Group, Emma and Usman Hasan shared an entertaining presentation that covered a lot of familiar ground. Nevertheless, it was succinctly put, and will be of value to a lot of attendees. Janet has been working on a very limited basis with the Fairtrade Foundation, but appears to have achieved some very practical results in the time available. She illustrated the value of user research and that it is possible, even in difficult circumstances. From consultants WM Reply, Baxter shared an entertaining tale from their work at Diageo that shows the benefits of both knowing the organisation in depth, and exploring a company’s history. Tanya Burak: Do we still need an all-in-one intranet? 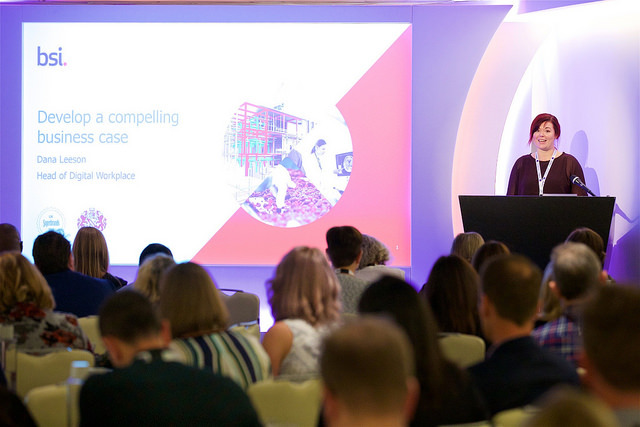 Tanya, from the property company Savills, introduced an fairy tale from an apparently happy kingdom suddenly threatened by visitors bringing new social tools, that would be familiar to anyone worried by the rise of shadow IT. Her pragmatic solution, I believe, is at an early stage and I look forward to hearing more about it. My favourite of the vendor talks this year, Kelly shared the benefit of her experience working with Interact, and filled her 9 minutes with solid advice. 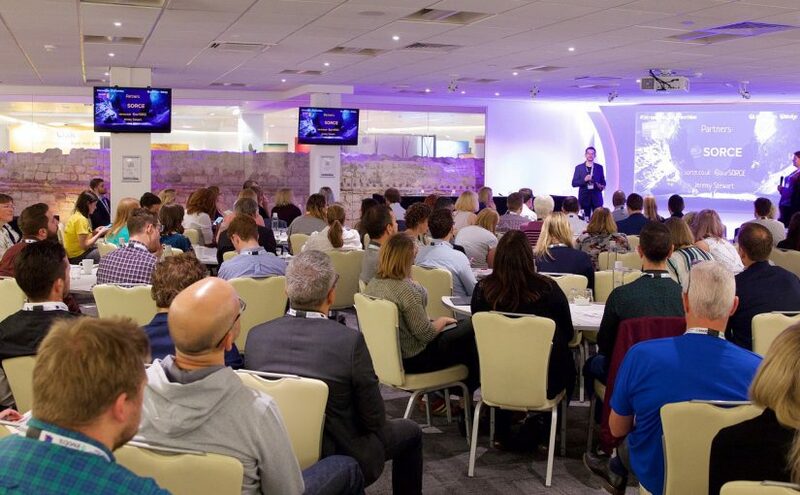 If “don’t wait for it to be perfect” and “treat it like a process, not an event” were all attendees took home, Intranet Now would have been valuable conference. My perspective, as I saw this from the lectern, might not be the best. Please find my notes on this page, Lessons from learning. I hope attendees started to think about how their intranets can become better points of access to learning tools and resources, and the potential effects this may have on culture and the way the organisation works. As I returned to normality, it was good to hear Howard talking about taking an intranet towards becoming a digital workplace. He introduced the ADKAR model for change management and shared some adoption advice from years of implementing intranets with CompanyNet. Ellen was the deserved recipient of the Intranet Now Diamond Award last year, and shared some of her experience at Azkonobel and touched on a number of familiar points about adoption. I’d love to hear more from Ellen at a more leisurely pace. Sukh, representing Oak Intranet, was delighted to present the company’s status as the originators of intranets as dubbed by Martin White two years ago. He also worked Don’t Stop Believin’ by Journey into his discussion on engagement. In another of my favourite talks, Dana discussed the massive investment in the digital workplace in order to support organisation growth. She described the importance of building a compelling business case, and how understanding users’ pain points could contribute to this. Ralf, from Electrolux, shared the day’s most frank presentation. 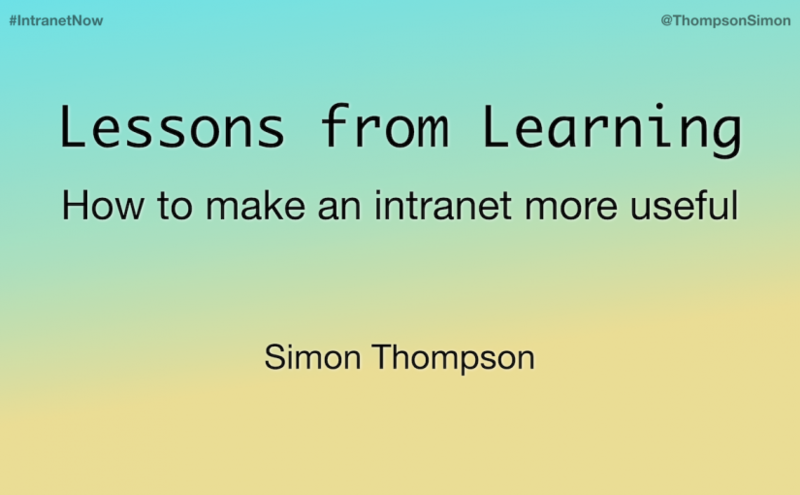 He discussed some of the failings in their latest intranet and the approaches they’re making to improve. I love their content idea of the “Grand Factory Tour” as a way to spread knowledge of the making part of the organisation. This year, intranet software firm Sorce did the unthinkable and embraced SharePoint with a new product. His message-on-a-t-shirt said it best “technology is just an enabler” although I may not forgive him for his endless SharePoint “Working on it…” animation. James was more than up to the challenge of the after-lunch slot, rapidly telling the audience “I’m not afraid of the i-word” even if he would then focus on digital workplaces and the importance of DEX or Digital Employee Experience. In his “Superpowers of DEX” approach, James has found a strong way to preach beyond the intranet converted with a vision that is powerful and communicable. Adam was highlighting some of the connected thinking at engineering firm Arup. In particular, their Global Tools Register which makes it much easier for staff to find the right tools, reduce duplication of effort, and helps Arup know what Arup’s people know. Scotty, named for Scottish Water, not Alex, is the utility’s new intranet, and an impressive Step Two award winner. Alex shared some of the employee-centric thinking that led to its launch and ongoing improvements. 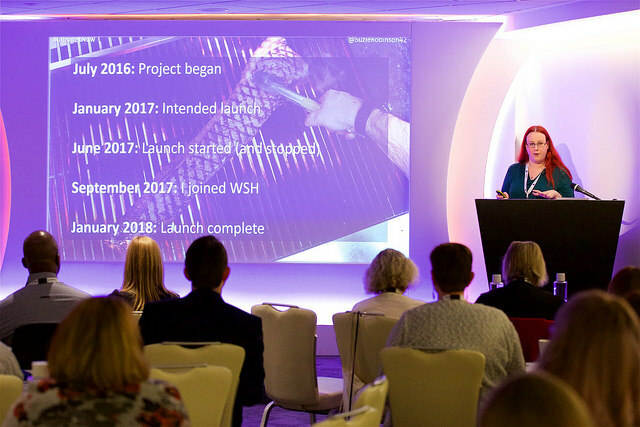 For the final intranet-related presentation, Suzie shared what she’d learned having taken up ownership of caterer WSH’s intranet a year before, and it’s exactly what a intranet manager needs to hear. Yes, things hadn’t been going as planned. No, the intranet had had no user research. But, with effort to reassure colleagues and management, by making simple but visible improvements, and focus on real needs, Suzie is is getting the intranet back on track. In a brilliant change of tone, yoga guru Donna Noble took the audience through a simple breathing exercise. The single minute felt like ten, much to the surprise of me and many others. A series of workshops hosted by sponsors appears to have been well received, and I must credit each of Invotra, Oak, WM Reply and Sorce for the effort they put in. Running alongside this were a number of table panels, and I enjoyed the discussions. The day closed with the Intranet Diamond Award, naturally going to Intranet Now’s co-founder Brian Lamb, and a final panel session. Drinks were provided by the Digital Workplace Group. As an attendee, I think the 9 minute talk format is about right. As a speaker, it’s really hard to condense what you want to say into that time. The day felt better paced than before, but I’d have liked some of the table discussions to have allowed more in-depth follow-ups. The sponsors made their presentations far more practical than before, and I appreciated that. I’d wanted to speak at Intranet Now since the first event in 2014, but this was the first year that I really felt I had something worth sharing. That said, I didn’t count on how much effort it would take me to find a format, make the content work, design the slides, and then cut and cut again so I’d be confident I wouldn’t rush the talk. Waking on the Friday morning, I was surprised to feel a general sense of ease. My thanks need to go to Lisa and to Wedge their belief and support, and to Ian Fenn who confidently told me a year ago that I should go for it. Also, I’m grateful to Scott McArthur, a confident and able speaker who, at IntraTeam in Copenhagen this March, made me feel that I really could take that step forward.